Download the user-friendly QUOTE FORMS below OR use our online form to send directly to our sales team! H1 (STANDBY OR INFREQUENT SERVICE) Powerhouse and utilities, infrequent handling. Hoists used primarily to install and service heavy equipment, where loads frequently approach rated load, and where the hoist is idle for 1- to 6-month periods of operation. H2 (LIGHT SERVICE) Light machine shop, fabricating service, and maintenance. Loads and utilization randomly distributed. Rated loads infrequently handled. Total running time not more than 12.5% of the work period. H3 (MODERATE SERVICE) General machine shop, fabricating service, assembly, storage, and warehousing. Loads and utilization randomly distributed. Total running time not more than 25% of the work period. H4 (HEAVY SERVICE) High-volume handling of heavy loads, frequently near rated load in steel warehousing, machine and fabricating shops, mills and foundries, with total running time not more than 50% of the work period. Manual or automatic cycling operations of lighter loads with rated loads infrequently handled such as in heat treating and plating operations, with total running time frequently 50% of the work period. H5 (SEVERE SERVICE) Bulk handling of material I combination with buckets, magnets, or other heavy attachments. Equipment often cab operated. Duty cycles approaching continuous operation are frequently necessary. User must specify exact details of operation, including weight of attachments. CLASS A (STANDBY OR INFREQUENT SERVICE) This service class covers cranes which may be used in installations such as power houses, public utilities, turbine rooms, motor rooms and transformer stations where precise handling of equipment at slow speed with long, idle periods between lifts are required and for infrequent maintenance. CLASS B (LIGHT SERVICE) This service covers cranes which may be used in repair shops, light assembly operations, service buildings, light warehousing, etc. where service requirements are light and the speed is slow. Loads may vary from no load to occasional full rated loads with two to five lifts per hour, averaging ten feet per lift. CLASS C (MODERATE SERVICE) This service covers cranes which may be used in machine shops or paper mill machine rooms, etc. where service requirements are moderate. In this type of service the crane will handle loads which average 50 percent of the rated capacity with 5 to 10 lifts per hour, averaging 15 feet, not over 50 percent of the lifts at rated capacity. CLASS D (HEAVY SERVICE) This service covers cranes which may be used in heavy machine shops, foundries, fabricating plants, steel warehouses, container yards, lumber mills, etc., and standard duty bucket and magnet operations where heavy duty production is required. In this type of service, loads approaching 50 percent of the rated capacity will be handled constantly during the working period. High speeds are desirable for this type of service with 10 to 20 lifts per hour averaging 15 feet, not over 65% of the lifts at rated capacity. CLASS E (SEVERE SERVICE) This type of service requires a crane capable of handling loads approaching a rated capacity throughout its life. Applications may include magnet, bucket, magnet/bucket combination cranes for scrap yards, cement mills, lumber mills, fertilizer plants, container handling, etc., with twenty or more lifts per hour at or near the rated capacity. SATURN provides ongoing support for all our machines operating in the field. Whether you have a technical question or need emergency repair parts, our knowledgeable staff is always ready to assist you. SATURN has in STOCK most standard parts. Please be sure to have the machine’s SERIAL NUMBER before you call. The serial number will help us to better serve you in all cases. 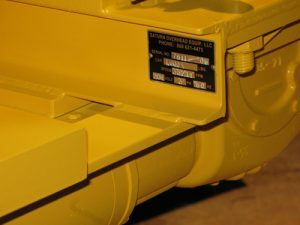 A Serial Number Plate can be found on ALL machines unless it was removed in the field. Please see the photos and descriptions below for assistance in locating this plate. HOISTS See Front Channel or Plate on hoist framework near motor. TRACTORS See Front Plate on tractor framework near tension spring. END TRUCKS See End Truck Framework on inward/drive side. Our Parts & Service HOURS are 8AM to 5PM – Monday thru Friday. SATURN OVERHEAD EQUIPMENT, LLC guarantees that all parts and components of its products, which are manufactured by SATURN, are free of defects in material and workmanship for a period of ONE year from date of shipment. This guarantee is made to the original purchaser only and requires that the machine is properly applied, installed and maintained. Any part of SATURNâ€™s manufacture that is found to be defective during the period covered by this warranty will be repaired or replaced after examination of such a part by SATURN. All defective parts must be returned to SATURN freight prepaid and will be sent back to customer at his expense. SATURN shall have the sole right to determine whether to replace defective equipment. Machinery, parts, accessories and components manufactured by others are warranted only to the extent of the original manufacturerâ€™s warranty. SATURN shall not be responsible for the cost of field labor or any other expense incurred by any party through removal or reinstallation of repaired or replaced equipment. Unauthorized alterations, additions and repairs will result in loss of warranty.